The Magnum PES42 family PoE Power-Source Edge Switch combines standard 802.3af PoE with a small heavy-duty,six-port Ethernet Switch. Using an external -48VDC power source, four of the PES42's Ethernet ports can provide power as well as 10/100 Mb data transmission over the interconnecting Ethernet cables.Data and power for the attached devices can be transmitted over a single Ethernet twisted-pair cable to each, cost-reducing installation and maintenance in an industrial facility. The other PES42 ports may be 100 Mb fiber for distance, noise immunity, ground-isolation and high bandwidth. 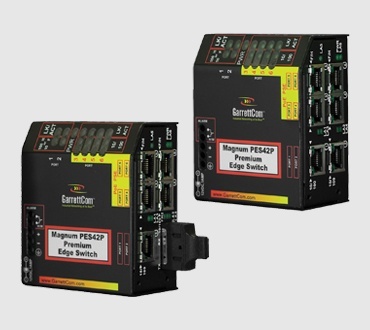 The compact PES42 Edge Switch design delivers 6 Ethernet ports. Four ports are always RJ-45 for PoE. 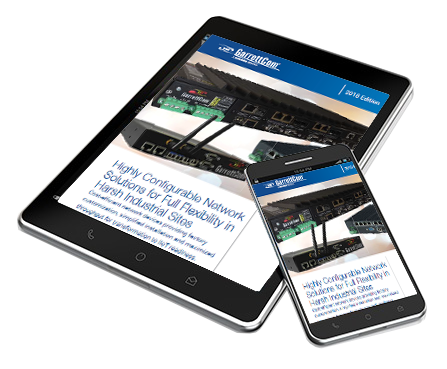 The PES42 base models have either two 100 Mb fiber and four 10/100 PoE copper ports, or one fiber and five copper ports, or six copper ports, four of which are PoE. PoE - 4 Power-Sourcing RJ-45 PoE ports per IEEE 802.3af.Ideal for PoE used in industrial IP video surveillance, wireless-access, VOIP phones, badge readers and support of similar hardened PoE devices. Port Flexibility - Offers 6switch ports, 1 or 2 of which may be 100 Mb fiber, others are 10/100 copper PoE. Redundancy - Includes Link-Loss-Learn (LLL) feature for use in self-healing LAN structures or Dual-Homing on ports 1 and 2.